When Verizon informed us that their rebate policy was changing and that top tier devices would no longer have $100 mail-in-rebates, but devices under $149 still would, a lot of people were concerned at what that actually meant. We were then provided with the list of rebate and non-rebate devices over the weekend, except the pricing situation was still up in the air for the top dogs. 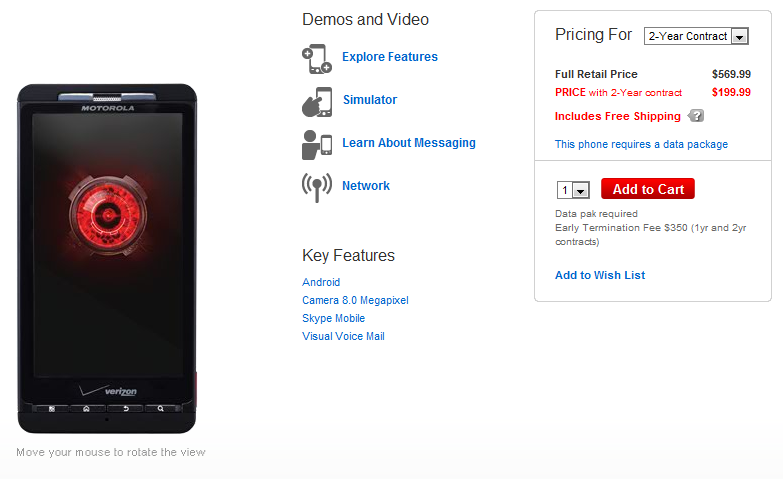 Well, as you can see from the shot above, the DROID X which used to be a $299 plus $100 MIB device, is now just listed at $199, which is great news. You no longer have instant discounts or mail-in-rebates for these top tier devices and we couldn’t be happier. HTC Thunderbolt Release "Sooner than we expected!"